Why just keep your finger on the pulse of genome editing when you could also be keeping your thumb on the high-content screening (HCS) fast-forward button? New platforms are emerging that can make quick work of your genotypic and phenotypic screening workflows, from CRISPR targeting efficiency analysis and 3D cell culture, to integrated live-cell analysis. Learn how to research more and pipette less with automated, high-throughput phenotypic screening. CRISPR has already ignited the imaginations of a generation of scientists. 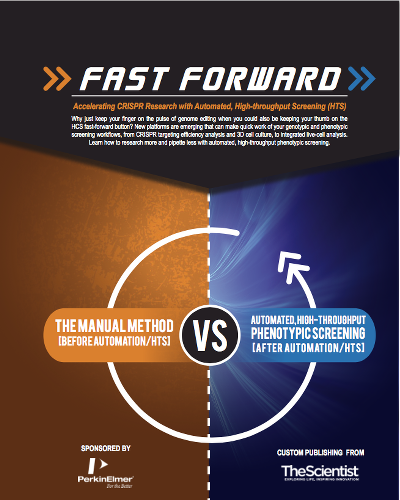 Now, automation is enabling genome editing with higher throughput with less hands-on effort. Download this poster from PerkinElmer to learn more.